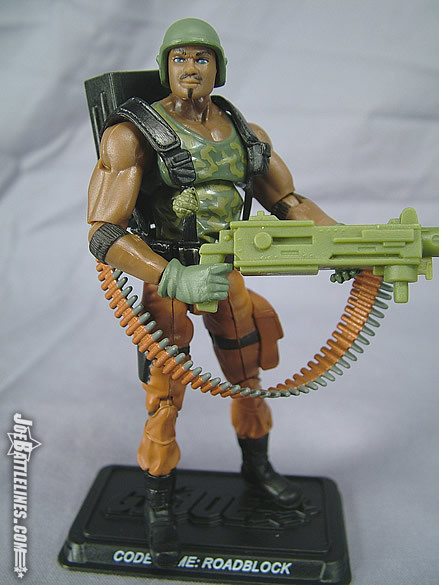 I find it rather ironic that when most people think of the GIJoe team’s heavy machine gunner, it’s the second character to hold that title that comes to mind. Making an impression upon fans of both the cartoon and the comic series, Marvin F. Hinton is the character that comes to mind. Whether it was his animated rhyme-scheming persona or his larger-than-life comic appearances, Roadblock has always been a fan-favorite and it’s no surprise that he makes his debut in the premiere boxed set of the 25 th Anniversary line. Does this figure live up to the hype or is he more akin to Duke and Gung-Ho? Once again, Hasbro went back to the premiere version of a character for the anniversary character design. 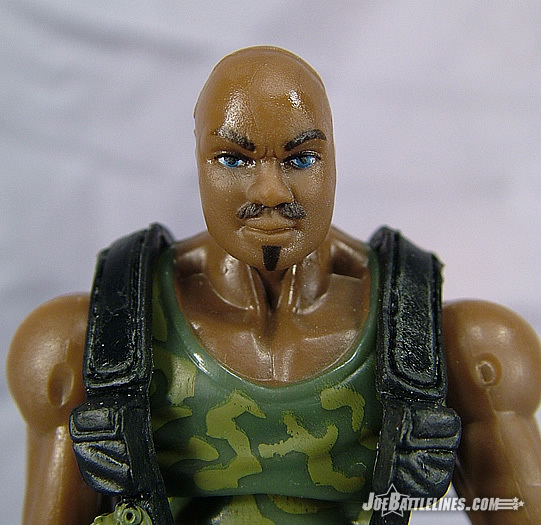 Roadblock is the spitting image of his 1984 incarnation right down to the camouflage tank top and the dark green gloves. Even his pants are the same rust-brown hue with his boots also painted black. He’s large and bulky—which is how Roadblock has been portrayed over the years growing larger and larger in the mind’s eye of fans. As such, this figure brings that to life perfectly. 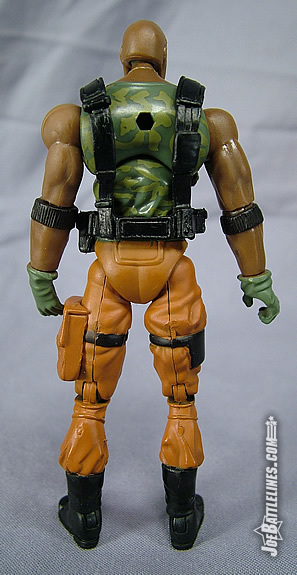 While his original harness was molded on, this anniversary version features a removable web harness that is complete with sculpted “pineapple” grenade. Like all figures in this line, Roadblock is a “new construction” figure with the waist joint removed and the mid-torso joint in its place. His upper leg appears to be painted as does the top of his lower legs. It is interesting to note that there is a section around his knees that appears to either be unpainted knee pads or lines left over from the possible inclusion of the double-jointed knees that are featured on so many other figures in this line. I’m not entirely certain as to the origin of this design anomaly but it is worth pointing out. 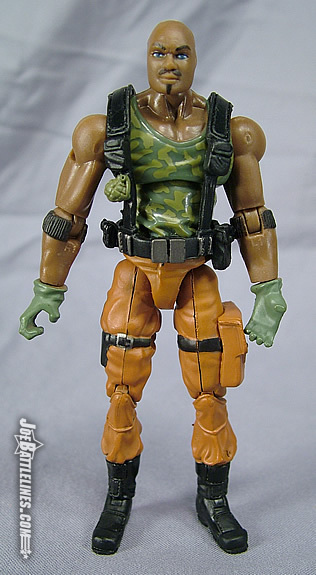 Like Gung-Ho, Hasbro felt the need to distract attention away from the figure’s elbow joints by including in molded black bands on his upper forearms. Personally, I find them a bit distracting but they don’t detract too much from an otherwise solid character design. 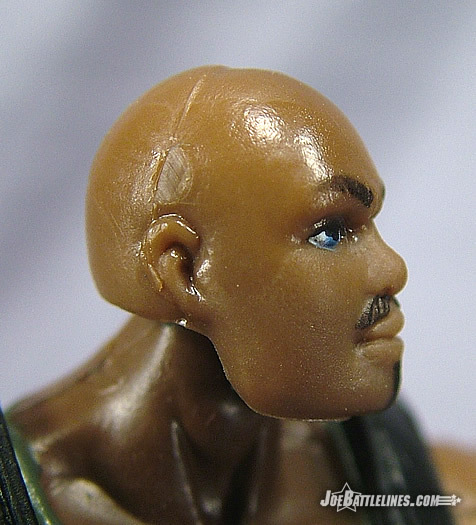 Much like Duke, Roadblock’s head sculpt seems more inspired by an animated appearance than it does a comic appearance. The face is very round and soft and almost a bit small for the body. (This figure comes with the same helmet as Duke which might explain why his head is a bit smaller than his frame.) In fact, this is almost an anime face—which is a bit odd considering that Roadblock never appeared like this in either comic or cartoon form. In fact, his animated countenance almost suggested a bit more age than some of his teammates—something that this face most certainly does not. I’m not entirely why but the very anime look of this sculpting pulls me right out of accepting this as a serious Roadblock figure. 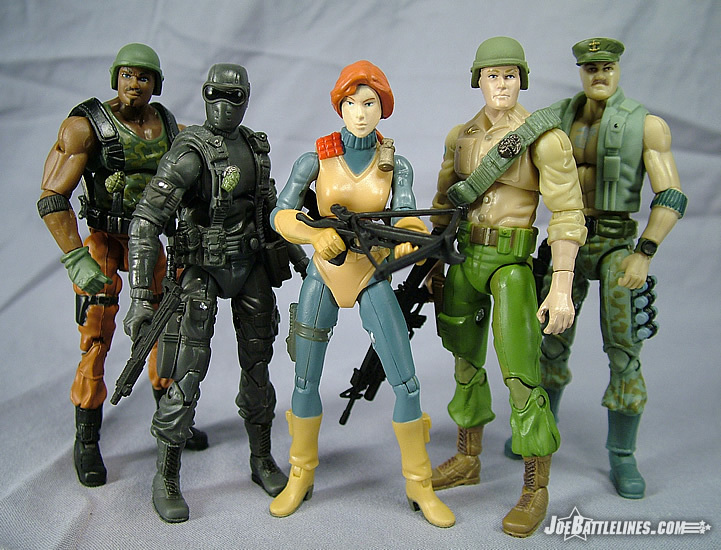 I know that there has been a lot of debate in some fan circles as to the various head sizes in the GIJoe eras. ARAH had larger heads and GvC featured some of the smallest ones to date. The 25 th Roadblock falls into the same camp as the Spy Troops Destro with one of the tiniest noggins for a Joe yet. He looks decent with his helmet on but remove that and you’ll start to wonder just what Marvin said to that witch doctor to anger him so. 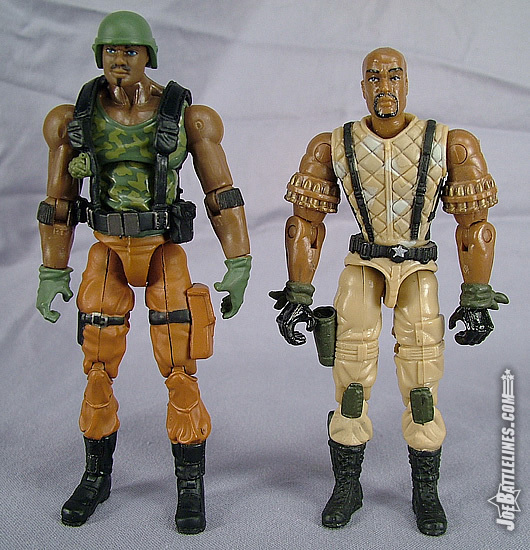 When it comes to gear, Roadblock is equipped with a similar kit to his 1984 ancestor. 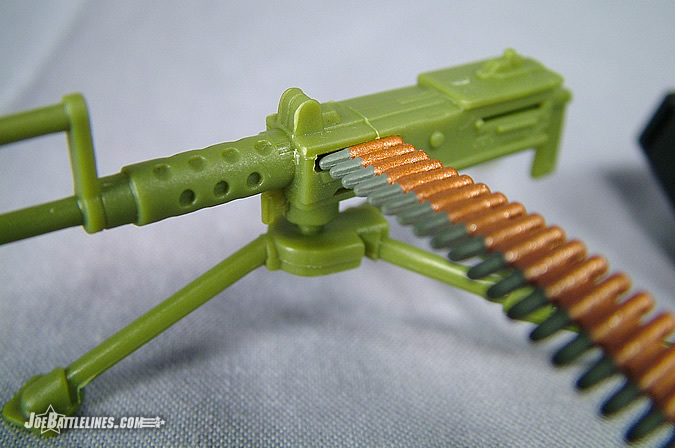 He’s got his green Browning M2 “Ma Deuce”, with a matching tripod as well as his green combat helmet. 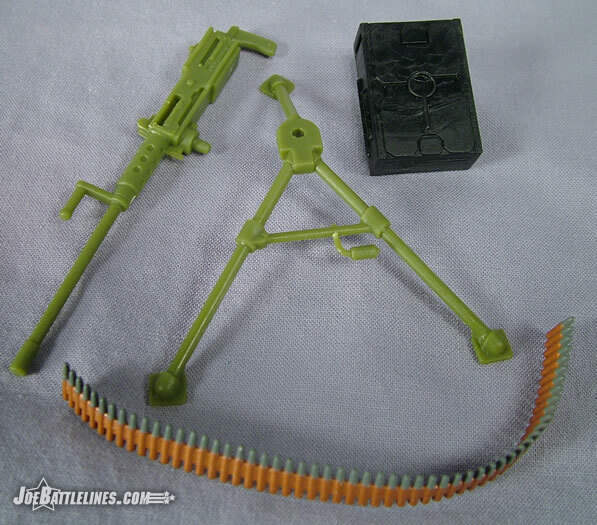 Also included (in addition to the file card and figure stand) is black ammunition backpack and, for the first time ever, an ammo belt. 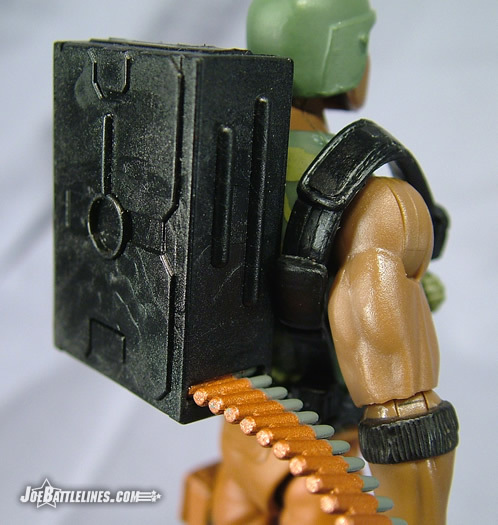 The belt, which in early promotion pictures was shown draped over his shoulder, fits nicely into the side of the M2 and the backpack, throwing in a nice dash of realism into the figure’s design. This is a detail that works and works well—even though the inclusion has a few consequences on the figure’s design that I’ll address momentarily. Unlike both Duke and Gung-Ho who can’t properly use most of their included gear, Roadblock can hold his over-sized machine gun. The soft nature of the hands requires a bit of work and the light weight display stand doesn’t stabilize the figure all that well but it is possible, with a bit of work, to achieve some nice poses. Once again I’ve arrived at the “things that could be better” portion of the review. In Roadblock’s case, however, I don’t have nearly as many issues as I do with the majority of the figures in the GIJoe battle pack. Yes, his head is undersized but this has been an ongoing issue with Hasbro for some time now. Unlike other figures in the line, his elbows can actually achieve a 90-degree range of movement. 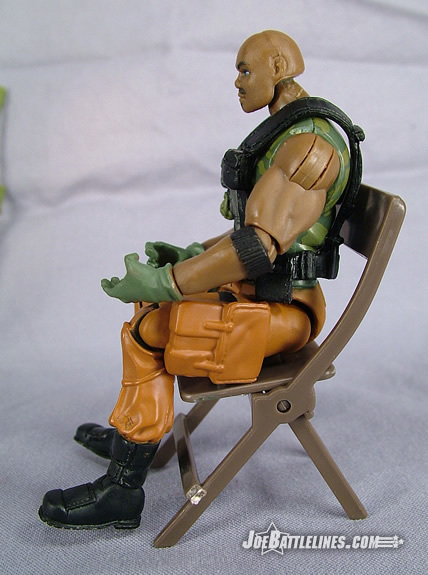 Roadblock can even sit reasonably well—with just a slight spreading of his legs. His mid-torso joint is next-to-useless for forward and backwards motion but seems to work well enough for side-to-side rotation. My only other issue with Roadblock is the pre-posed nature of his hands. 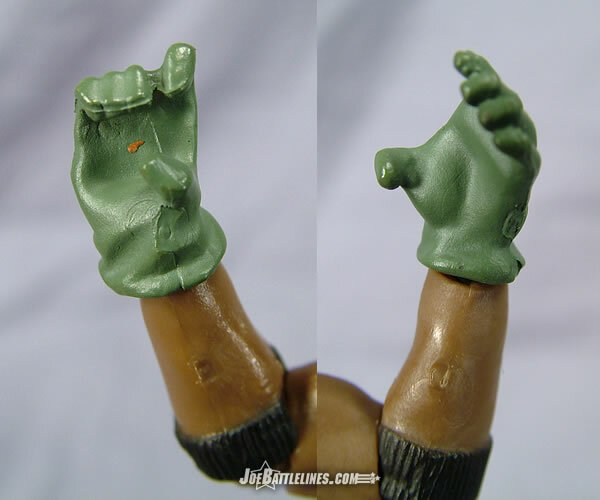 In 99% of GIJoe 3.75” figures released to date, both hands are portrayed in a “c grip” or holding position. It’s a standard grip that allows for the figure to hold weapons and accessories in both hands. 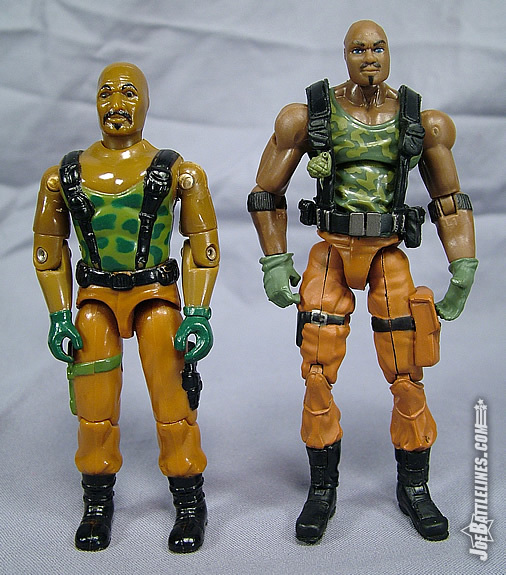 In Roadblock’s case the hands have been modified for him to hold his M2. This means that his right wrist is slightly upturned while his left wrist is sculpted in more of an “open holding” gesture. As I said before, this is a positively minor detail when compared to the debacle that is some of the other figures in this series thus far but I feel it’s worth noting so that fans approach these figures “eyes wide open”. 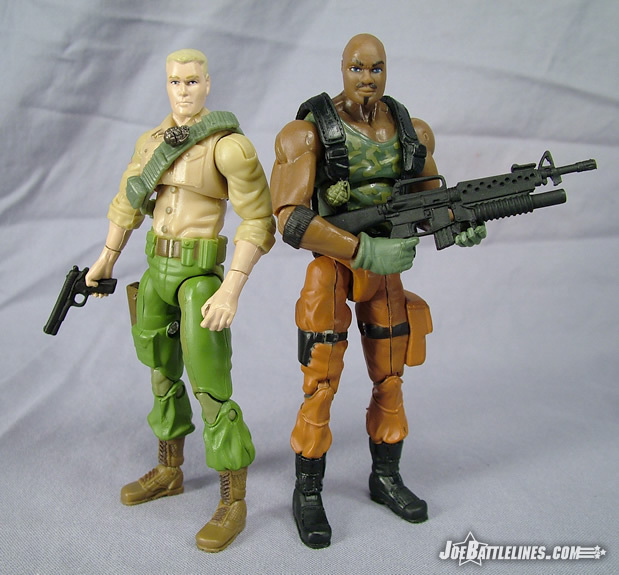 Roadblock is one of the figures in this line that really makes me regret the fact that we never got an update of him in the DTC line. His larger torso would have been a perfect re-use for the Major Barrage body and a new head would not have been that hard to produce. 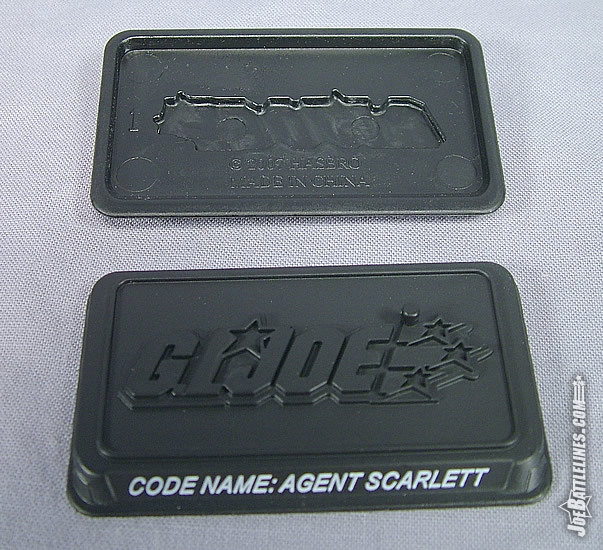 This version is the shining jewel in the GIJoe battle pack—with really just a few minor issues worth noting. He’s so close to great that the tiny “baby faced” head is more frustrating than normal. He’s also the most poseable of the line. Seeing this design makes me wonder that if this design was rendered in the previous construction, would a 25 th Anniversary Roadblock even have been necessary. If it were possible to buy this figure singly, I’d recommend it. However, to add him to your collection you’ll have to get stuck with two turkeys and two “okay” figures. Still, he’s one that I can recommend so I’ll just leave it at that.